Homeowners, you know what’s coming. The first fall downpour will have your gutters gushing with the outflow, causing your lawn to turn from firm to soggy. It doesn’t have to be that way. Installation of rain gardens, plants to help absorb water before it runs off into streams, can create more natural ways to control rainwater. The gardens also decrease the amount of pollutant-tainted runoff flowing in creeks, rivers and ultimately Puget Sound. A free workshop is scheduled Sept. 29 at Everett’s McCollum Park to help property owners interested in rain gardens and in taking other steps collectively called rainscaping to help curb runoff. “It’s our kickoff event for the county to promote ways to use landscape features in a way that helps rainwater soak into the ground,” said Peggy Campbell, a senior planner for Snohomish County. The workshop also will cover alternatives to lawns, the plants used in rain gardens, finding ways to reduce paving, rain garden maintenance and rain barrel installation. Gardening expert and KIRO radio personality Ciscoe Morris is scheduled to talk at 2 p.m. on environmentally friendly gardening. “I’ll be talking about picking the right plant for the right place, good bugs eating bad bugs, and all kinds of things like that,” Morris said in a telephone interview with The Daily Herald. Morris said he also will be giving away plants that work well in rain gardens. Some are drought tolerant and some attract hummingbirds, among other qualities. Environmentally friendly gardening works with nature instead of against it and makes gardening more fun, he said. By taking steps to avoid using poisonous substances, gardeners are helping protect Puget Sound and the environment as a whole, he said. 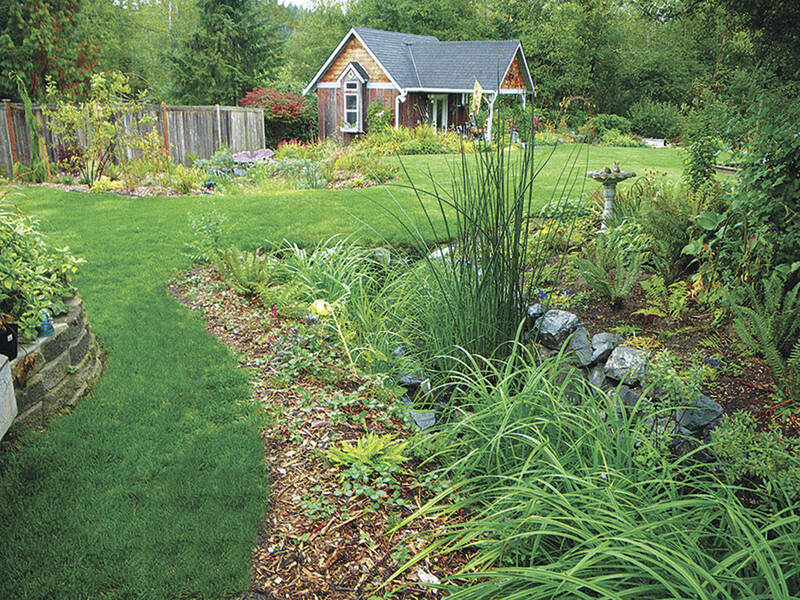 Philomena Kedziorski, rain garden coordinator for WSU Snohomish County Extension, said some people turn to rain gardens to help with drainage problems on their property or with basement flooding. Rain gardens can be installed in a relatively compact space of about 100 square feet, she said. The “it” factor is infiltration, the rate at which soil is able to absorb and, as a byproduct, cleanse water. Soil must be tested to have good infiltration rates before rain gardens can be established. In the city of Everett, homeowners have installed more than 50 rain gardens through the city’s rain garden rebate program, Kedziorski said. Rain gardens are divided into three zones: plants that thrive in drier conditions, those that can tolerate some standing water, and plants that grow best in wet conditions. Water sampling by the United States Geological Survey found the presence of herbicides in streams throughout King and Snohomish counties, Campbell said. If you can get the rainwater to soak into the ground first rather than flowing into the streams, lakes, rivers or Puget Sound directly, most pollutants are broken down and filtered out, she said. Where: WSU Snohomish County Extension and the Northwest Stream Center at McCollum Park, 600 128th St. SE, Everett. When: Noon to 4 p.m. Sept. 29. Correction: An earlier version misspelled Ciscoe Morris’ name and Peggy Campbell’s name, and misstated the phone number for the event.